Driver’s Choice Awards Go to the Honda Civic and the Honda CR-V! It’s that time of year again! The editors at MotorWeek have just revealed the list of this year’s Drivers’ Choice Award recipients, and two of Honda’s vehicles have found themselves at the top of their segments. In the category for Best Small Car, the winner was the well-loved 2017 Honda Civic, and in the Best Small Utility segment, the 2017 Honda CR-V received the honor. The MotorWeek Drivers’ Choice Awards are based on an analysis of “the factors mattering most to consumers—price, practicality, performance and fuel efficiency,” so you can trust that these Honda models are offering just what West Michigan drivers are looking for. Learn more about the 2017 Honda Civic and the 2017 Honda CR-V by reading on below! The Civic and the CR-V have long been favorites of drivers in West Michigan, and their 2017 models are better equipped than ever before. The Civic Sedan that drivers know and love comes equipped with a 158-hp, 2.0L DOHC i-VTEC 4-cylinder engine, and this year for the first time, Honda has also produced a Civic Coupe that comes standard with the same engine! In addition to its Sedan and Coupe stylings, this year’s Civic is also being offered as a Hatchback! This model has been designed with maximum cargo storage space of up to 46.2 cubic feet and a fiery 174-hp, 1.5L turbocharged DOHC 4-cylinder engine. In the 2017 Honda CR-V, power and off-road capability come together in a spacious and efficient package! The baseline CR-V LX offers a 184-hp, 2.4L i-VTEC 4-cylinder engine, and what’s more, Real Time AWD with Intelligent Control System is available on every trim! With its excellent fuel economy and standard, versatile 60/40-split rear seating, it’s easy to see why the CR-V is so popular. 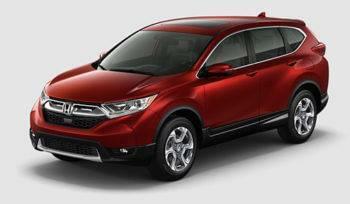 Test Drive the Civic or the CR-V! West Michigan drivers who want to take the Honda Civic or the Honda CR-V for a test drive can schedule a visit at their local West Michigan Honda Dealers location. You’ll love how you feel behind the wheel of your Drivers’ Choice Award winners. Get the most out of your visit by exploring our current offers and financing options today!